CADIZ — The Harrison Hills City School District Board of Education recently discussed the installation of a cornerstone for its new school building. 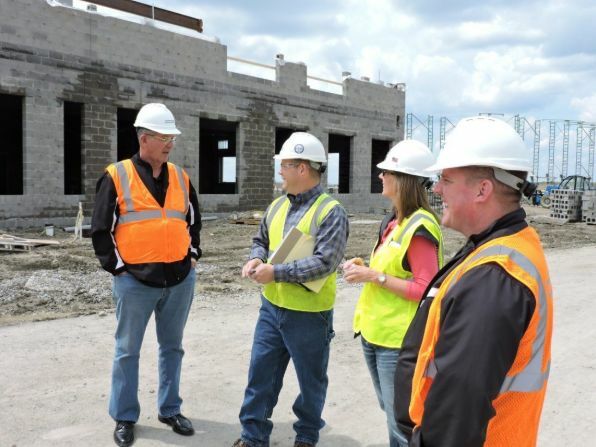 The board met at the construction site of the new school complex just off of state Route 9, along with representatives from Hammond Construction, Randall L. Gallagher Monuments and local Freemasons from Cadiz and Freeport. They discussed placing the monument cornerstone on the new school campus. Greg Trellis and Doug Crabtree represented Masonic lodges 219 and 415, from Cadiz and Freeport, respectively, and said the Masons of the county are interested in donating the cornerstone to help commemorate the new construction of the K-12 complex. The new building is scheduled to be open for the 2019-20 school year. “This is the biggest thing to happen in Harrison County in my lifetime,” said Trellis about why the Masons want to contribute the stone to the new school. During the discussion, the two Masons presented preliminary ideas about the cornerstone to the board and Randy Gallagher. The group agreed the ideal place for the new stone would be at the main entrance to the high school building. and join the 934 satisfied Subscribers.